kid friendliness: limited seating inside is all on high barstool chairs, but some room for strollers and lots sweets for takeaway. 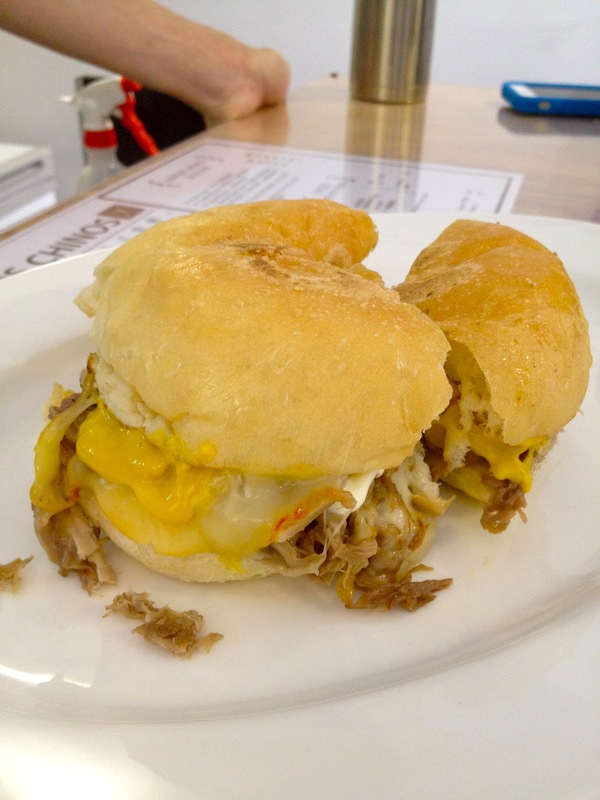 It has a more cafe/casual feel than TM Bistro and the lunch menu includes sandwiches, wraps and soups. With a few tables and bar stools, it's a cheerful place to meet a few friends for coffee. I was obsessed with it for awhile, but now I can share it with you guys. 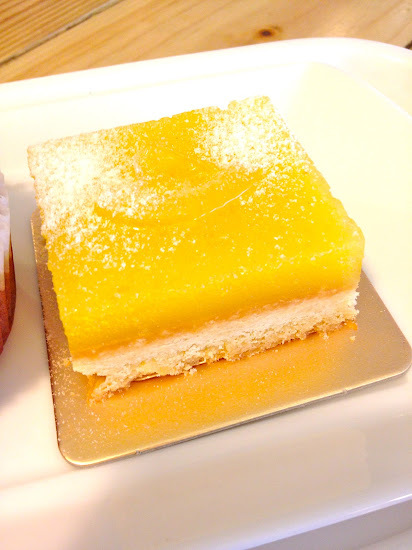 What I loved about Tartine was the unusual flavors for the macarons that you might find- some of the other shops might have black sesame, salted caramel and raspberry- but Tartine also has chocolate yuzu, peanut butter and jelly, mango/pineapple. There are also homemade chocolate chip cookies and brownies and other baked goods. 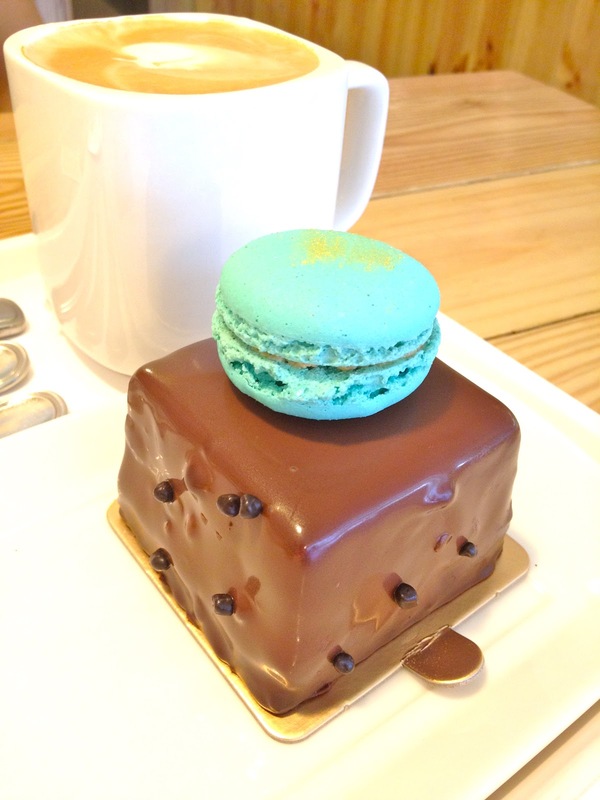 I was tempted by the choco chip, but the price NT$65 was too steep for me. There's also a ton of desserts, including the popular strawberry mille-feuille. 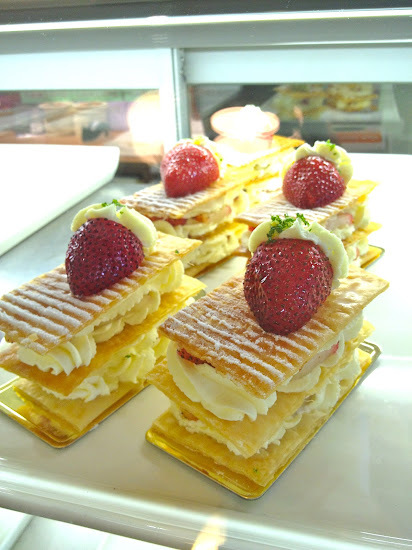 Many of the desserts are too pretty to eat and I could imagine getting a little box full of little cakes and tarts for a friend for a birthday surprise instead of a typical cake. You may have also spotted Tartine's desserts at Mitsukoshi A8 which opened in the fall of last year, and I also spotted a "pop-up" counter at Hankyu Mall last week. (At a passing glance, I believe the prices are higher at the mall locations than at the original shop, but it could be that prices went up at Tartine as well). How cute is this? 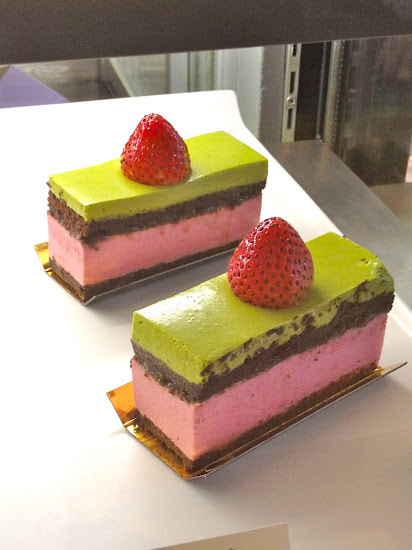 I don't like mousse, but I love the playful marriage of pink and green. With so many flavors, how can one decide? Good thing that I have friends who have as big as a sweet tooth as I do. Thanks to my friend L who treated me to this afternoon sugar high for my birthday last year. 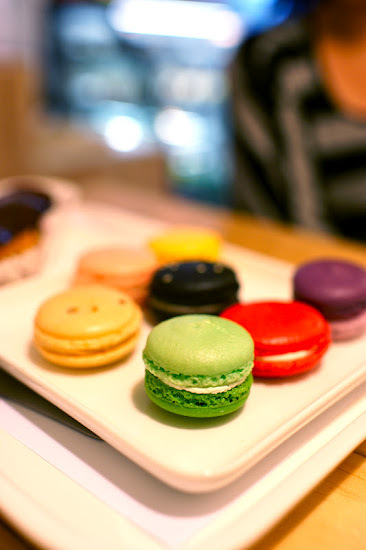 In the beginning, I thought it was kind of cute that the macarons at Tartine are different sizes, some tall and some fat. I think it gives it a bit more personality, though some might want the precise exactness of other patisseries? Tartine also informed us that we should wait 5 minutes or so for the macarons to defrost. Tartine and TM Bistro were the first places that I've tried that keeps their macarons at such a cold temperature, that the macarons can be very hard if you can't wait so long for them to warm up. 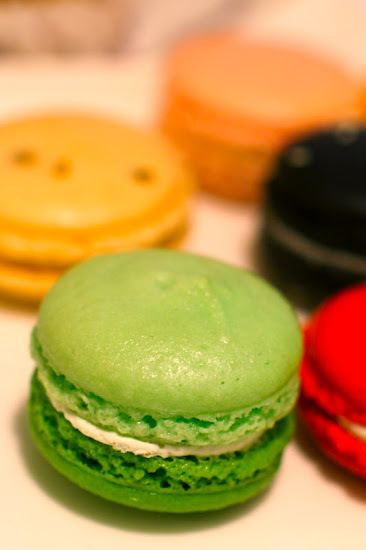 Though on a later visit, about six months afterwards, they seemed to have figured it out and created a level of standard sizes for the macarons. Peer pressure! My friend loved the chocolate eclair. 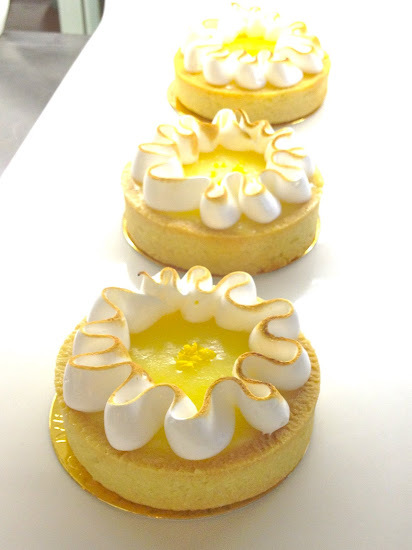 On follow up visits, I reordered my favorites- the salted butter caramel and pink grapefruit macarons and gave the banana cream tart a try. I love the packaging and the font choices in Tartine's signage and boxes. 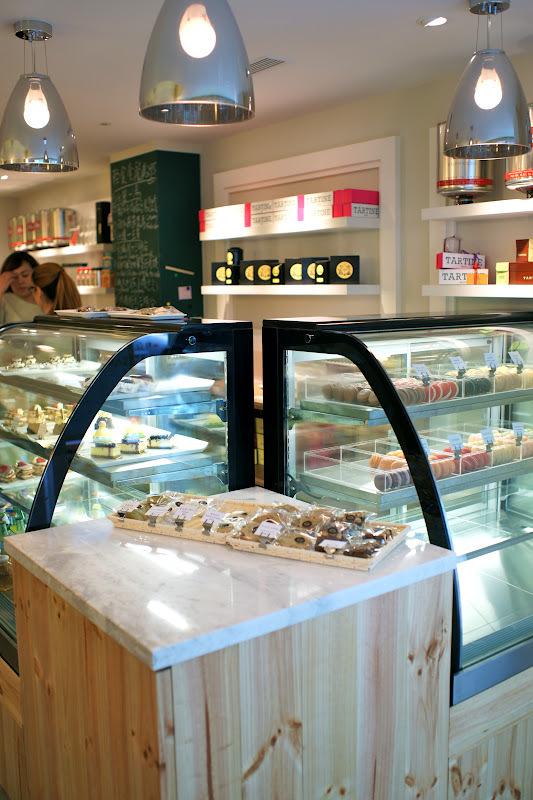 It really does feel like a little bakery or cafe you would find in LA, SF or NY. Another fun thing about Tartine is that they mix and match their shells in some of their macarons to emphasize the different flavor combos.. At the original shop, the NT$65 per macaron price is one of the lowest in town where I've spotted macarons going for over NT$100 at Taipei 101. Crazy. But at their mall locations, the macaron prices are NT$80. Pomegranate & Mint, Strawberry & Kiwi, Red Bean & Sesame, Blueberry & Passionfruit Cheesecake!!?! Don't tell me you're not curious. 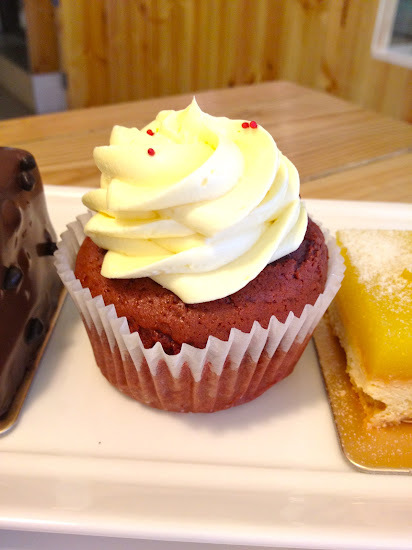 I love that Tartine have things that I miss from the states like lemon bars and red velvet cupcakes too. Unfortunately, American comfort food has American sticker prices, so pick and choose carefully depending on your budget.. Personally I'd rather pay NT$150 for a rich chocolate grand cru cake topped with a macaron than NT$150 for a red velvet cupcake, but that's because for cupcakes I can make my own or I have my sources. Plus the cupcake is not that much bigger than a regular cupcake and not as sweet or moist as I'd prefer. If you couldn't tell, I love desserts, so I could probably work my way through Tartine's menu if I didn't have to worry about all the calories and prices. No. 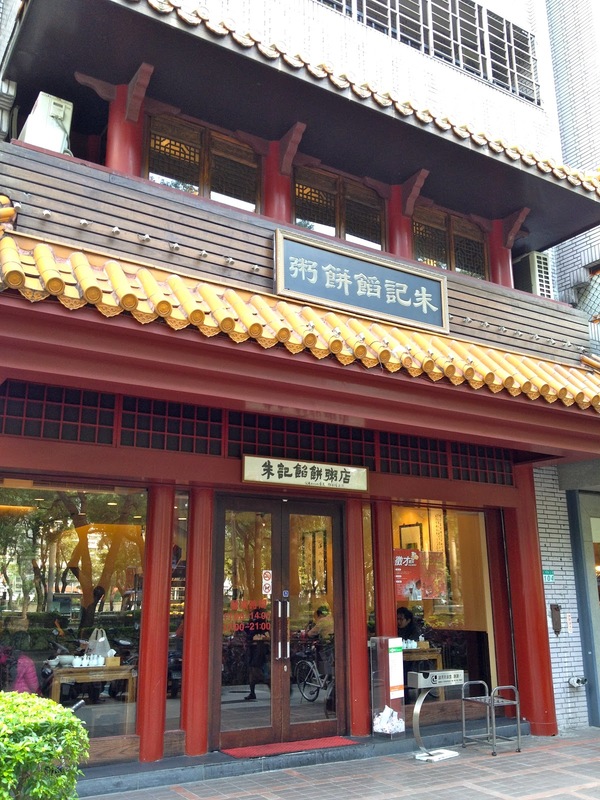 8, Lane 38, TongHua St. 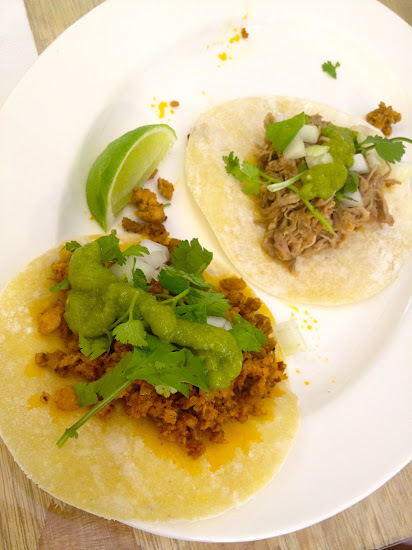 Barely four weeks old, Dos Chinos is the newest "Mexican in Taipei" spot to try. While not as small as Taco to Go (which I saw smartly revamped its space to make the kitchen smaller to make more seating available), it's pretty dang tiny with only seven seats inside. 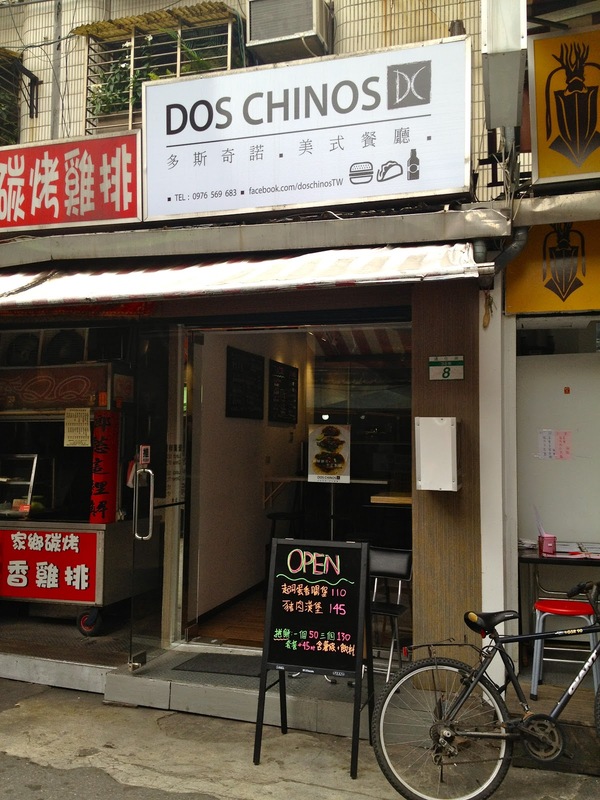 Dos Chinos= two Chinese guys opening up a taco shop in Taipei. Dos Chinos keeps it simple by offering only soft tacos and burgers with fries and drinks. No chips, no pico de gallo, no hard taco shells, no quesadilla fussiness. Just chorizo, carnitas, chicken and veggie tacos. Don't know if that will change in the future, but they make the most of their supplies by also offering a pulled pork or chorizo egg and cheese burger. 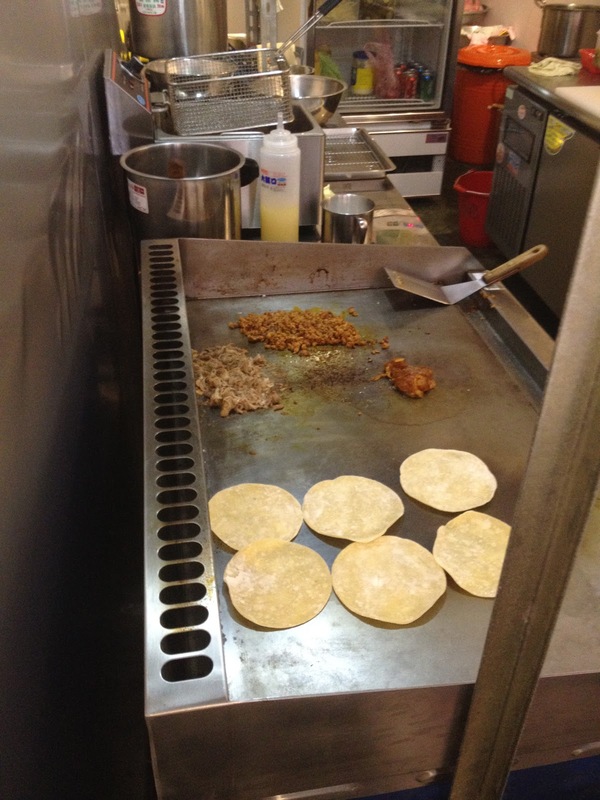 The tacos are NT$50 each, or 3 for NT$130, with a fries and drink meal option for NT$175. 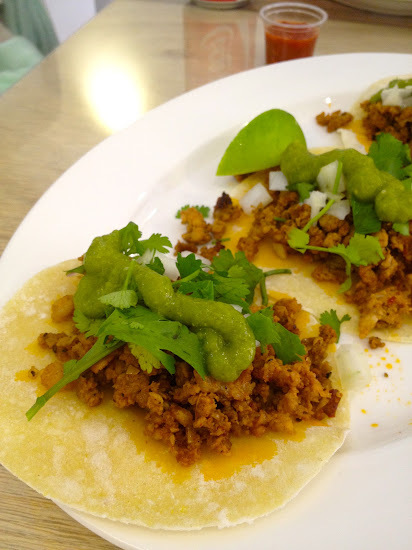 Chorizo is definitely a rare find in Taipei and Dos Chinos makes a good rendition of the spicy ground pork. Tortilla, a pile of meat, cilantro, onions and some green chili sauce. Squirt on some lime and you're good. 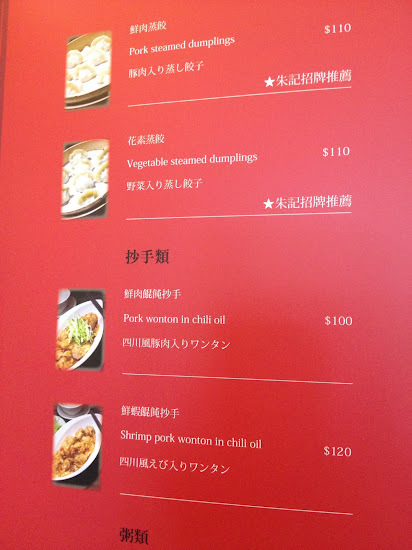 There's also a spicier red chili sauce that we had on the side. I like how everything is made to order so the food comes out hot. While places like Juanita are quick, a complaint I've heard from friends is that the food sometimes is not hot, especially towards the end of the day. I also don't mind that the tacos have only one tortilla instead of two. 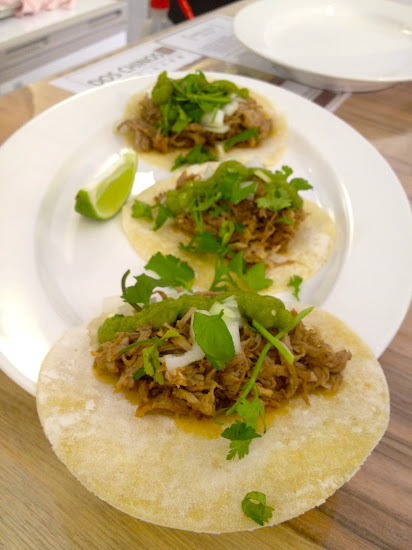 Next up, the pulled pork tacos. Spot on. While the tacos are not huge (as they are not supposed to be), I think they put a fair amount of meat in them. That being said, one would probably need to eat 4-6 of them to be full. 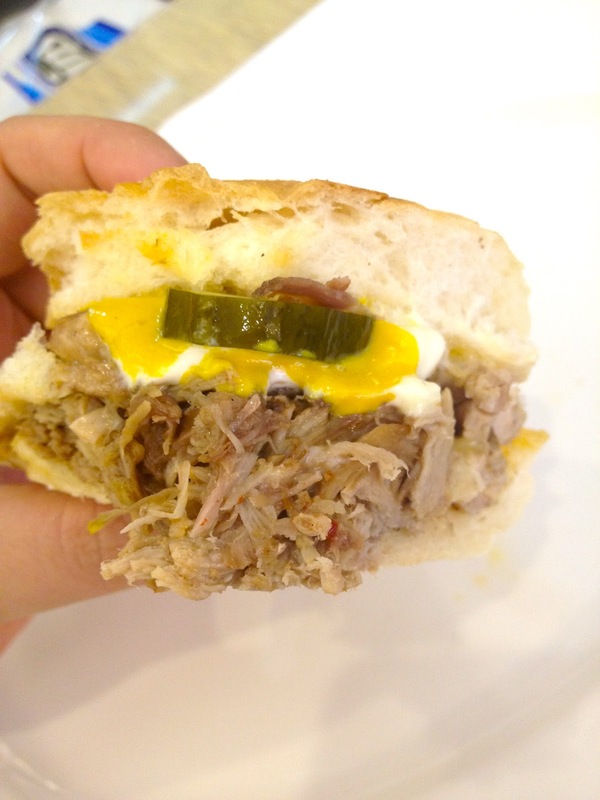 My two friends and I shared two trio of tacos which wasn't really enough, so we ended up trying (and splitting) a pulled pork burger (cuban style) (NT$175) which came with muenster cheese and pickles. The chef was kind enough to cut it into thirds for us. Haha. Mostly everything at Dos Chinos is housemade, including the pickles and the chorizo. While Taipei will probably never get a taco stand that will please everyone, Dos Chinos is one step closer and definitely worth a try. It's definitely better than the overpriced tacos you'd get at many of the sit down restaurants around town. You could drop by before going to the Tong Hua night market or late night on friday nights for their happy hour. Thanks to reader Jackie for giving me the heads up! Zhu Ji was one of the first places my family friend took me to when I visited Taipei when I first started spending more time here, probably 9 years ago- it was near her office, it had vegetarian options for her and my mom and it had great prices. The red and golden storefront made for a memorable and lasting impression, so on my repeat visits, I recognized it even before I knew where RenAi Rd was or a "xian bing" was. 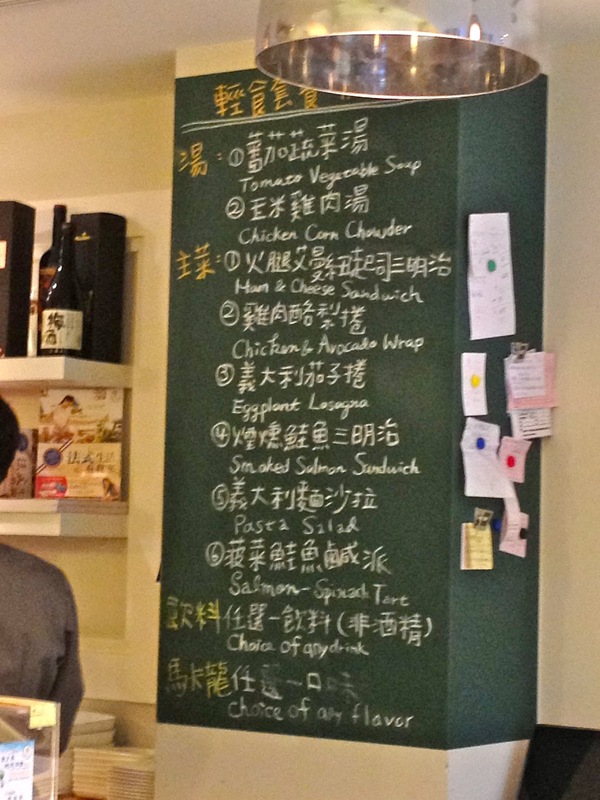 In fact, a version of a post for this restaurant has been sitting in my blog posts folder for at least 8 years. The two story restaurant is busy at lunchtime, but not touristy enough yet that you can't grab a table by walking in. It also helps that they have many locations across Taipei. Upstairs has more tables to seat larger groups, while the main floor has peek into the dumpling wrapping open kitchen. 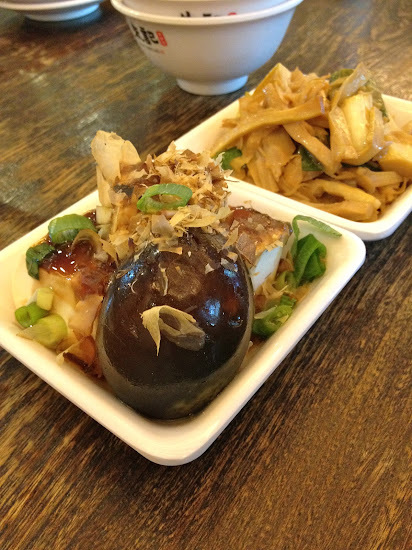 Small plates of cold dishes (NT$40/each) are available in the back, perfect for sharing until your food arrives. Find the decked out shelves and help yourself to your choice of pickled vegetables, spicy eggplant or choice of tofu/soy. My favorites include bamboo, eggplant and thousand year old egg with tofu. They have a pretty large selection compared to most places, which works for my mom who is vegetarian. Hey, I just noticed the plates have gotten slightly (considerably) smaller since my last visit two years ago. 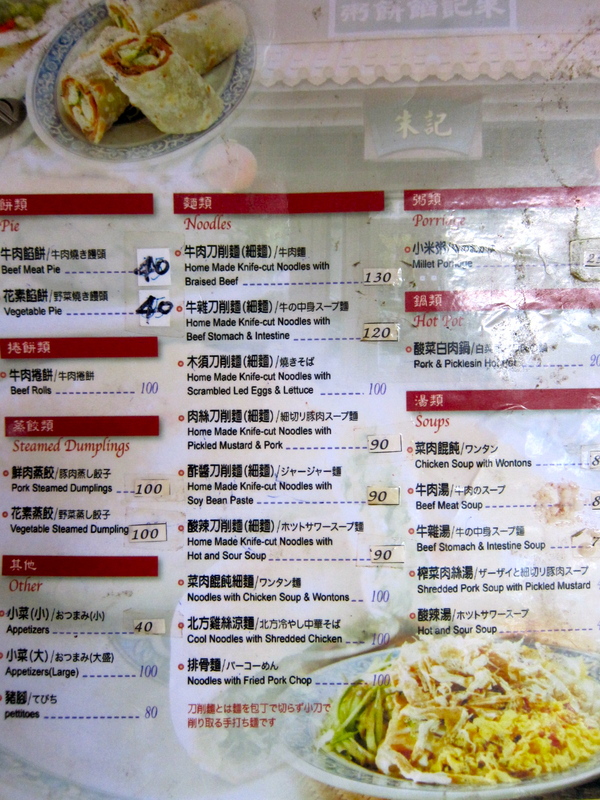 Ordering is off a check off sheet in Chinese, but if you ask for an English menu, they have one. It's funny to also see how the English menu has evolved from a greasy, one page laminated sheet to a full fledged fancy book, with pictures next to each item for easy identification. 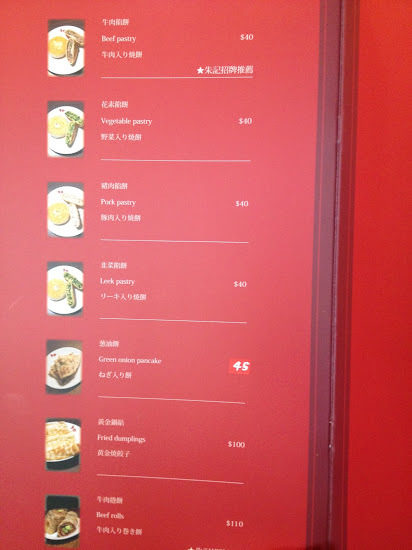 So what to order? 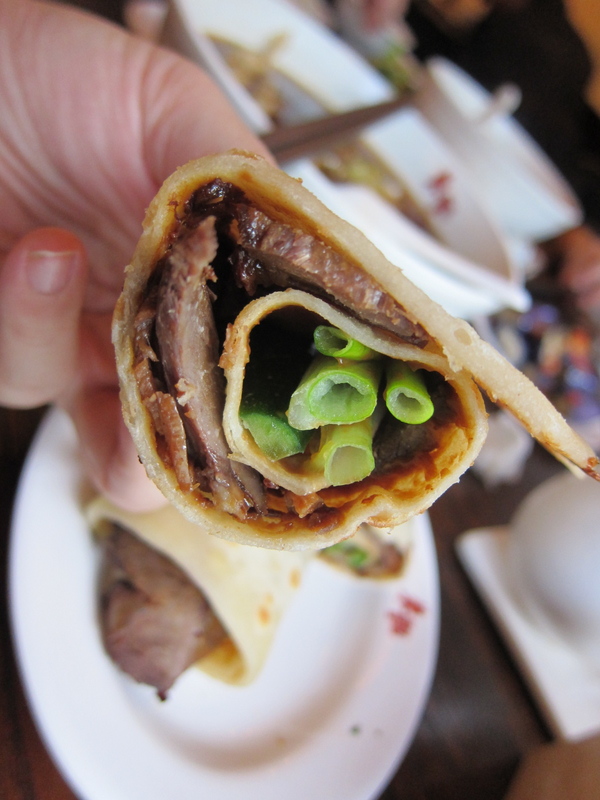 You have to order the house specialty- xian bing (NT$40)- which comes filled with beef, pork, vegetables or leek. In English, it's listed as a "beef pastry," in the past as a "beef meat pie," I've also heard it called a "beef pancake." 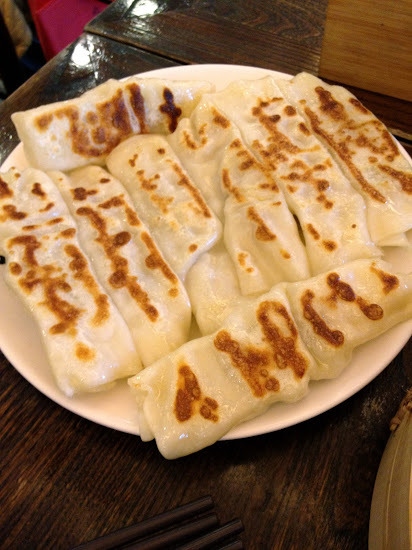 Tastewise, it's probably can be described as a pan fried, flattened dumpling. 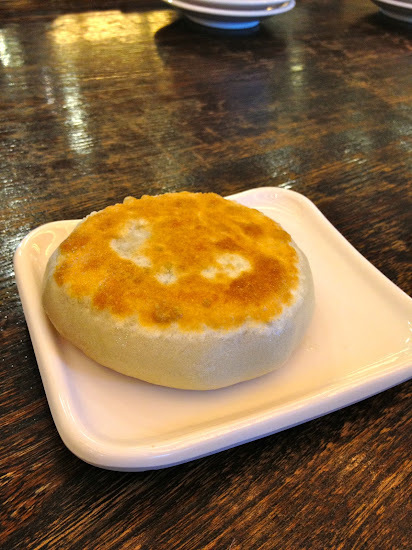 The dough is thinner than a bao, but breadier than a regular dumpling, while the patty-like meat inside is juicy seasoned ground beef with spring onions. Like a burger, it's a bit hard to eat without making a mess, as you can't eat it in one bite without having juices dribbling down your chin. 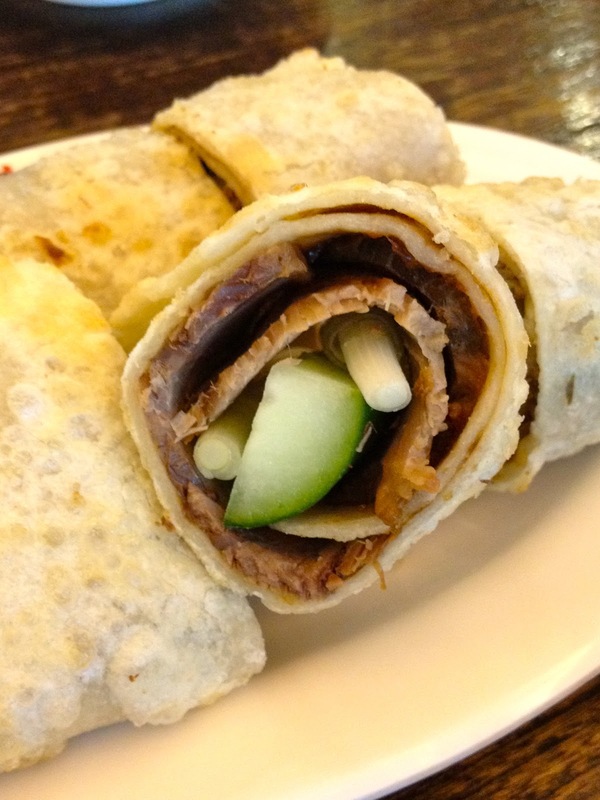 Another one of my favorites is the beef roll which is a spring onion pancake rolled up with beef and spring onions and hoisin sauce. 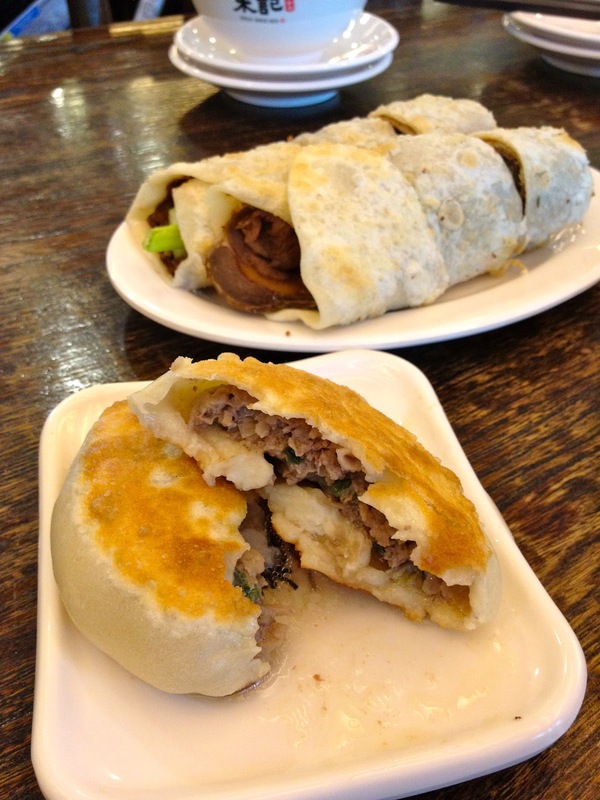 The chewy yet flaky wrap makes for a surprisingly satisfying compact appetizer and is not as messy as the xian bing. Everytime I see this, I have to order it and I think Zhu Ji makes some of the best ones. I usually pull out the spring onions and just keep the cucumber inside, since I don't really like raw spring onions. 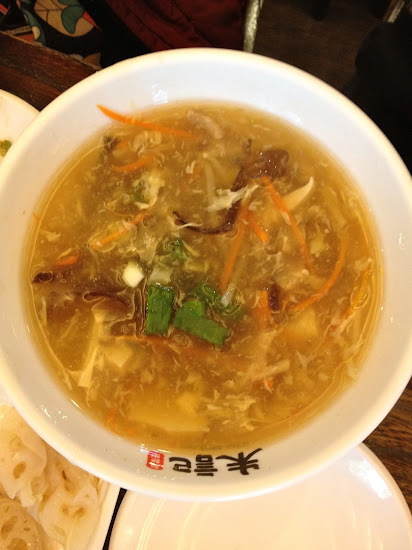 There's also quite a few noodle soups to choose from- beef noodle soup, won ton noodle soup, hot and sour soup, cold noodles with shredded chicken or to name some. The great thing about Zhu Ji at this location is the knife cut noodles, which come in long wavy strips and have a fresh chewy bite. The soup was a tad salty for me on this visit, but I've enjoyed it on other occasions at their Mitsukoshi location (which doesn't have the knife cut noodles). 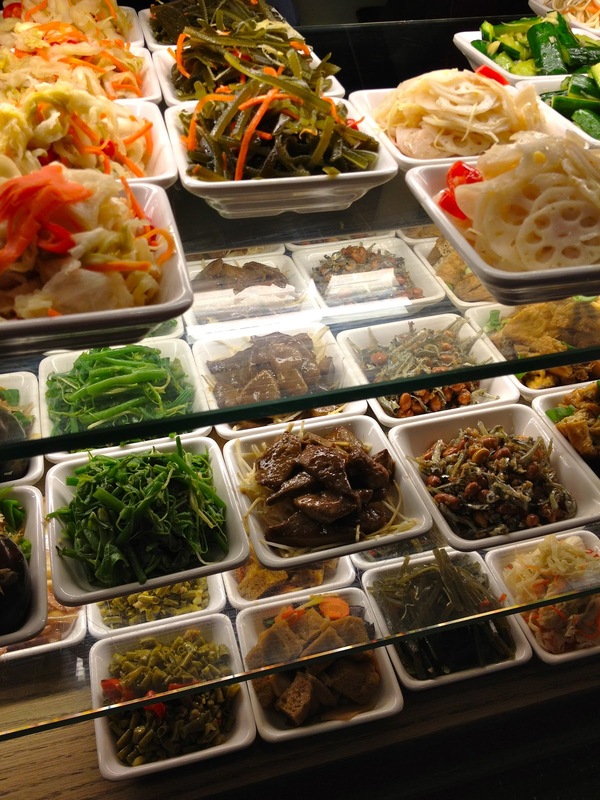 For my favorite knife cut beef noodle place, check out Shan Xi Dao Xiao Mian- it's not as nice of an atmosphere, but the food is great. 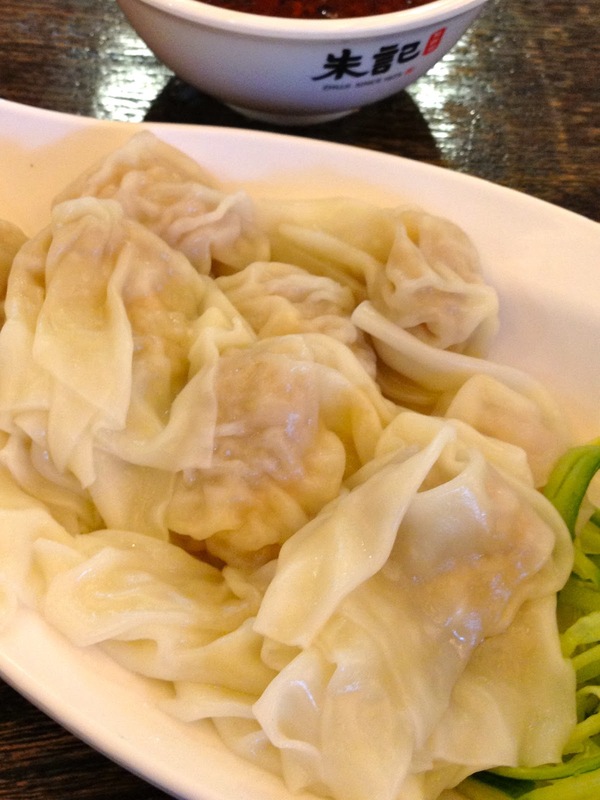 Skip the wonton noodles, a bit mushy and bland. 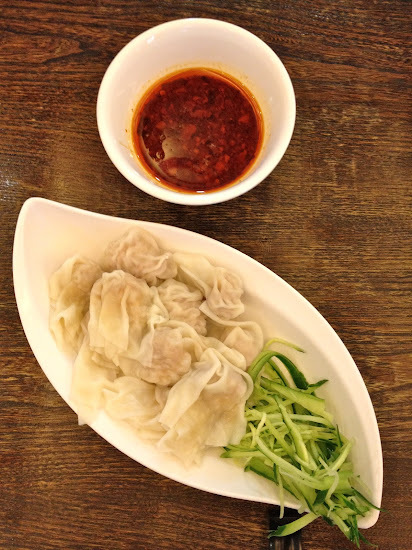 And of course there's no shortage of dumplings to choose from- steamed pork dumplings (NT$110), veggie dumplings (NT$110), shrimp pork or pork wontons, pan fried dumplings.. the best thing about eating with family or a large group is that you can share to sample them all! 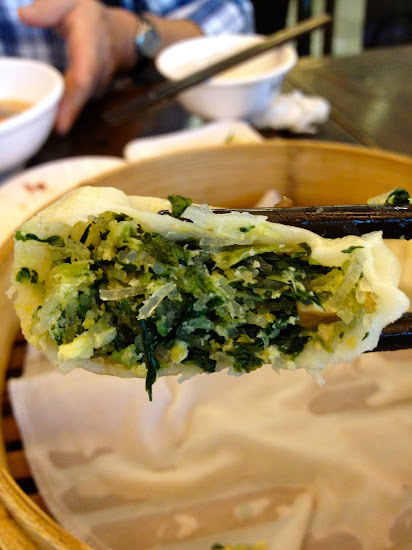 I quite like the veggie dumplings which come with finely chopped chives, glass noodles and mini cubes of tofu. I probably wouldn't order the pan fried dumplings (NT$100) again as they were not crispy as I've had at other places (for perfectly pan fried dumplings try Ma Shan Tang or Zhang Ji Fried dumplings or the local chain Ba Fang Yun Ji). 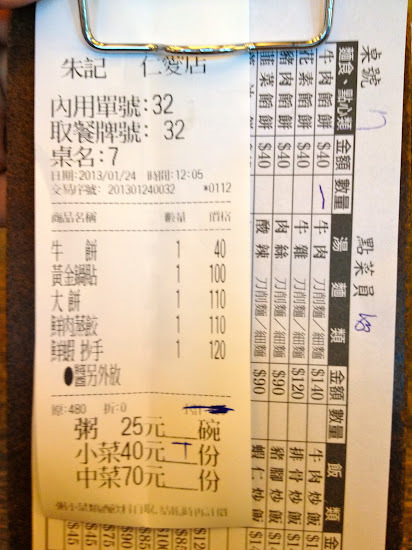 Come hungry since you will leave full.. Order a table full of food for less than two baskets of Din Tai Fung XLB and use your savings on dessert. No.7, Zhongshan S. Rd., Zhongzheng Dist. No.202-3, Sec. 2, Zhongcheng Rd., Shilin Dist.